Inland Pacific Ballet brought together a creative dream-team to bring The Little Mermaid to the stage with Portland-based choreographers Daniel Kirk and Eric Skinnerutilizing innovative aerial technology to create the feeling of a real underwater environment. New lighting design by Nick Robinson adds to the illusion, along with internationally-acclaimed scenic designer Nancy Seruto’s creative set designs. 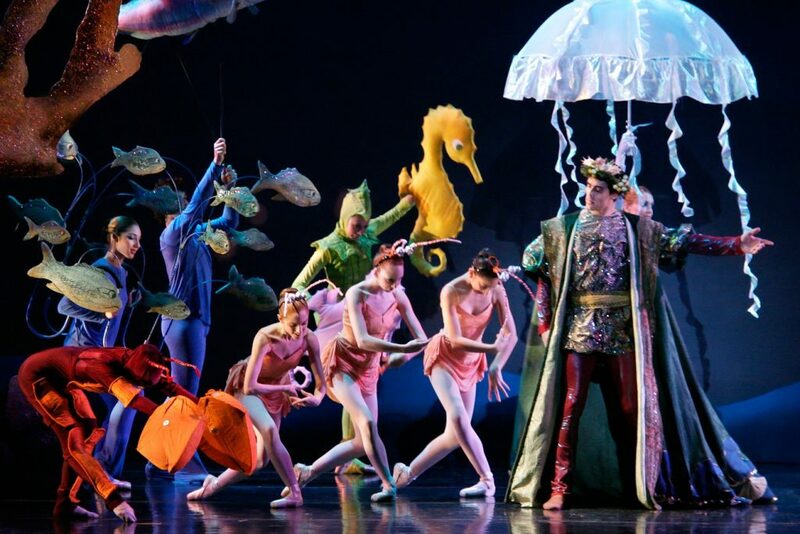 Designers Craig Sheppard and Jeanne Nolden created a spectacular blend of ornate costumes and delightful puppet sea creatures that swirl and spin. New this year are additional puppet creatures created by Jesse Mooney-Bullock of MoonBull Studio(custom puppet works, fine art sculpture engineered for live performance), and Inland Pacific Ballet Artistic Director Victoria Koenig conceived a lush, sweeping sound collage of great composers, more like a cinematic score than a traditional ballet soundtrack, which includes the music of classical composers Ravel, Debussy, Britten, Vaughan Williams, Janacek, and Dvorak. Over the past 24 years they have built Inland Pacific Ballet into the premier ballet company in the region, enjoying critical acclaim while performing the largest and most varied repertoire in the area. The Company’s repertoire includes such classics as A Midsummer Night’s Dream, Les Sylphides, Graduation Ball and Swan Lake Act II. Full length classical masterpieces include Giselle, Coppélia and a lavish production of The Nutcracker. Contemporary classics include seminal works by the legendary George Balanchine including Serenade, Concerto Barocco and Who Cares? and a growing body of original work that includes creative adaptations of much-loved stories such asThe Little Mermaid, Cinderella, Beauty and the Beast and Dracula. The Little Mermaid has performances on Saturday, April 6 at 2 p.m. and 7:30 p.m., and Sunday, April 7 at 7:30 p.m. at Fox Performing Arts Center, Riverside;Saturday, April 13 at 2 p.m. and 7:30 p.m., and Sunday, April 14 at 7:30 p.m. at Lewis Family Playhouse, Rancho Cucamonga; and April 27 at 2:00 p.m. and 7:30 p.m. at Bridges Auditorium, Claremont. Tickets start at $24 with senior/child/group rates available. For reservations and information, please visit IPBALLET.org.